Enlli is an island off the Lleyn peninsula much loved and much visited by our family. Both pieces were made using photographs taken by my husband Mike Alcock. I drew the images from these and then reproduced them using my embellisher . 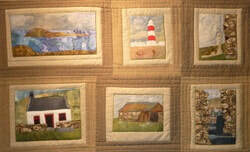 The resulting pieces were then framed and layered and quilted by hand. This is a church off the coast of Anglesey that has been cut off from the mainland by erosion. The little island it stands on is accessible at low tide. 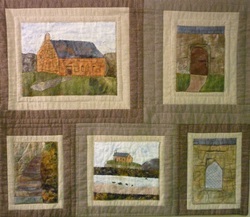 Cath was involved in the very first Quiltfest and at that time she was the organiser for North Wales for Project Linus. She is currently Chairman of the Arts & Crafts Committee of Denbighshire WIs.
Made for the Batik Beauties challenge 2009, theme "Delights of the Sea". Fish and Chips are a nostalgic seaside treat for many of us. Billy, my cousin's cat who used to lurk at eye level with the dining table, would be in heaven at a fish and chip counter! Batik fabrics in abstract textures suggested batter, chips and mushy peas, while others with retro patterns were perfect for the formica counter. 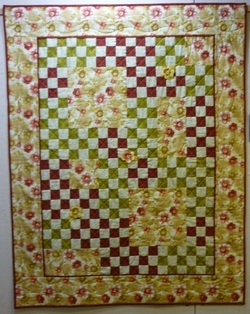 Machine piecing and applique; machine quilting (including trapunto) and big stitch hand quilting. The chip fork was cut from a Magnum lolly stick. Following a surfeit of jelly roll quilts seen at exhibitions during 2009 and 2010, we decided to work on our own interpretation.